Over the past decades researchers and companies have been working on developing phase change materials (PCM's) that have the potential to regulate temperature within a home. A phase change is when a material changes from a solid to liquid or from liquid to vapor. We all are familiar with the cooling that results from sweat evaporating from our skin. The phase change of evaporation requires energy. It draws heat energy from your skin thus resulting in cooling. John J. Morony has documented that a phase change of the moisture in compressed earth and adobe blocks results in significant cooling of rooms enclosed by adobe walls in the heat of the afternoon. Many green and natural building techniques including cob, adobe, earthships, strawbale and SCIPS make use of thermal mass to stabilize temperatures within a building. Typically thermal mass is warmed by the sun. The mass radiates heat when the room temperature is lower than the temperature of the thermal mass. When the mass is cooler, heat flows from the room into the mass as nature tries to equalize the temperature of the two. Natural thermal mass is very slowly warmed and it cools very slowly as well, so in climates such as south Texas where we have very hot nights during the summer and winter cold snaps mixed with warm days thermal mass can make for uncomfortable rooms as the mass heats rooms that are too hot already or absorbs heat when the room is too cold. Engineered PCM's may be considered to be improved forms of thermal mass. Phase changes add and remove much more energy than does the radiation from and into thermal masses such as stone which do not undergo a phase change. What's more virtually the only natural phase change material is water. The evaporation and condensation of water is limited to a narrow temperature range while artificial PCM's can be designed to phase change at a variety of temperatures. PCM's are frequently used inside cold boxes used for shipping medicines, food and live organs. In India PCM Energy P. Ltd sells them for use as built in emergency backups to mitigate loss of power to telecommunication facilities that must be kept cool. Their website "The University of PCM's" has many informative links. 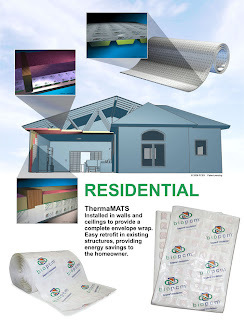 BioPCM of North Carolina has products including mats which can be installed in walls and ceilings. National Gypsum is working on a drywall substitute called Thermalcore which has BASF's Micronal PCM microcapsules embedded in it. It was recently promoted at the Greenbuild 2009 conference though it is not yet on the market, so you will likely be hearing about it in the mainstream press. The engineered PCM's have been tested through thousands of phase change cycles allowing the manufacturers to assure buyers that the materials will function for several decades. The challenge for any PCM was outlined in a May 2001 brief, Phase Change Drywall from the Department of Energy. In a heating dominated climate the transition temperature for the PCM must be near standard or suggested room temperatures (65°-72°F) while in a cooling dominated climate the transition must take place between 72°-79°F. In climates where both heating and cooling is required getting the correct temperature for the transition will be difficult. In addition manufactures will need to produce many variations of their product for various climates. This same Department of Energy brief pointed out that residential PCM's could eliminate the need for air conditioning in a mild climate. What if NIMBY isn't NIMBY at all?